Ralph Woodward was a music professor at Brigham Young University and founder of the Ralph Woodward Chorale, which he directed until 1994. Woodward was born in Shelley, Idaho, on November 21, 1918. He graduated from the University of Idaho in 1940. He began his music-teaching career at a high school in Idaho. After serving in World War II, he pursued a master's degree at the Cincinnati Conservatory of Music and a Doctor of Music Arts degree in choral music (the first awarded) from the University of Illinois at Champaign-Urbana. Afterward he taught voice and choral music at Drake University in Iowa for seven years. 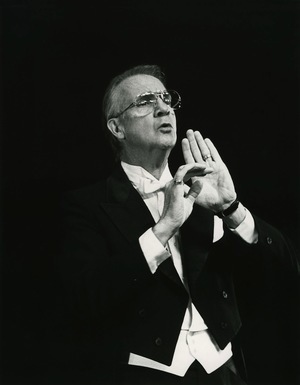 He then taught voice and conducting at BYU until his retirement in 1984. He helped the university become one of the preeminent music schools in the United States. He was a recipient of the Utah Music Educator and the Utah State Chamber of Commerce "Total Citizen" awards. Woodward was known for his work with the BYU A Cappella Choir, which was the first non-Roman Catholic choir to be invited to sing in the Notre Dame Cathedral in Paris three times. The choir also won the prestigious International Eisteddfod competition in Llangollen, Wales, and was the only American musical organization to perform at the International Society of Music Educators' Convention in Warsaw, Poland, in 1980. He also conducted the BYU Chamber Choir, Schola Cantorum, Oratorio Choir, and established the Male Chorus. He also guest-conducted choirs throughout the United States, including the Mormon Tabernacle Choir. Woodward married vocalist Margaret Barclay and they were the parents of three children, including Ralph Barclay Woodward. After her death, he married Mary Brown Firmage. He was a member of The Church of Jesus Christ of Latter-day Saints and served a mission to Nauvoo with his wife. He also served as a member of the Sunday School General Board and the Church General Music Committee. He wrote several church-music guidebooks. He died on September 6, 2005. This page was last edited on 8 February 2016, at 15:31.